New for this year is an interactive Muni map that I spent a couple of weeks to produce. I want some kind of mobile friendly interactive map for the web site but with limited choices it is better for me to create one. It is displayed on Google’s API so you can switch to other standard Google layers and even have street views. It is also designed to be printed as well. 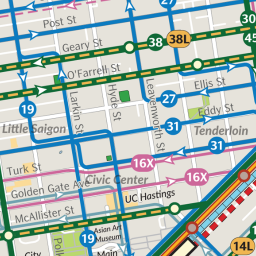 It includes some of the most recent changes like the 5L, two way Haight St and left turn for 29.